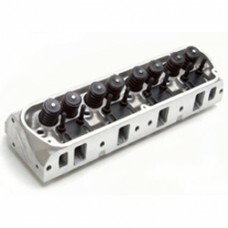 Edelbrock Performer RPM cylinder heads provide out-of-the-box bolt on performance with no additional porting required. Intake and exhaust runners are CNC profiled for superior airflow performance. Standard port locations enable use of stock or performance exhausts. Hardened valve seats for use with unleaded fuel. We stock these heads fully assembled and ready to bolt on, equipped with 1-piece swirl-polished undercut stem valves, seals, valve springs, retainers, keepers, rocker studs and hardened guide plates. Edelbrock Performer RPM heads are a great way to dramatically improve the performance of engines equipped with original equipment or cast iron heads. Match these heads with Performer RPM package for dramatic power increase from 1500-6500 rpm in high performance streetcars. Designed for 289/302 and 351Windsor Ford engines. These heads are fitted with 2.02.” intake valves for use with aftermarket pistons with large valve relief e.g. KB116. If using stock style pistons, use cylinder heads EDEL6022. 60cc combustion chamber, 2.02” Intake 1.60” Exhaust valve. Fitted with 3/8” diameter rocker studs (requires use of adjustable 3/8” roller rockers). Maximum valve lift .575”. Use intake manifolds for 289/302 EDEL7121, EDEL5021 or EDEL2921. Use intake manifolds for 351Windsor EDEL7181, EDEL5081 or EDEL2981. Use head bolts EDEL8552 for 289/302 engines (7/16”) or EDEL8553 for 351W engines with ½” head bolts. Use head bolt bushing kit on 289/302 engines with 7/16” head bolts (not required on 351W engines with ½” head bolts). Use head gasket FEL1011-2. Use Intake gasket FEL1250. Use roller rockers e.g. RUK66911C. An alternative part number head is available for engines fitted with roller camshafts.